Sci-Fi Folk @ the Heeley Institute – Maia – Sat 12th October – 8pm | IT'S HAPPENING IN HEELEY! Alternative acoustic act Maia will be performing at the Heeley Institute on Saturday, October 12th as part of a winter tour also passing through Whitby, Cornwall and Camden. 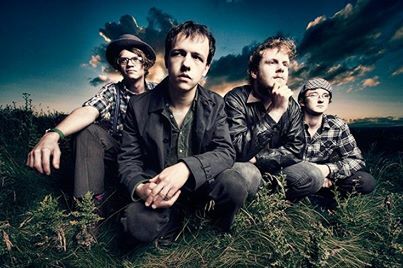 Tom Clegg, Joe Haig, Simon Robinson and Will Fletcher have been burning bright in the Pleiades open star cluster ever since harnessing vocals, guitars, pianos, trumpets, ukuleles and mandolins to invent Sci-fi folk back in Huddersfield in 2010. The Maianauts have subsequently been spreading the word far and wide, establishing themselves through well-received one-off performances on Radio 4 and at Hop Farm, Port Elliot and the Cambridge Folk festival as well as a residency underneath the Three Crowns in North London. Their appearance in Heeley marks the start of a series of winter gigs at the former chapel on Gleadless Road being organised by Big Boulder Promotions. “We’ll be providing an opportunity for people to experience intimate, acoustic performance with a strong emphasis on roots” explained Andy Whitehouse, of Big Boulder Promotions. “Maia are a fascinating band with irresistibly catchy songs and a wonderfully off-kilter view on astronomy, music and life”. good stuff maia were fantastic at big boulder-can’t wait to see them again! !